Most famous comic artist in Greece, Arkas, says that being born and dying Greek is a great blessing, but the period in between is a great misfortune. And even if that sounds as a paradox, I feel that he is right. being able to visit the Byzantine churches and knowing that their painters were your ancestors. Of course you feel extremely proud when you stand in front of the miracle of Hagia Sophia of Constantinople (today Istanbul), the mosaics of the Chora Monastery, the grandeur of Byzantine culture. How can you not to feel chills on the idea that you share the same blood with the Greeks resisted the monster of the Persian Empire and won, with Theodoros Kolokotronis and Athanasios Diakos, who fought the Ottoman Empire in the Greek Revolution, with the Greeks who said NO to an invincible force in 1940, when they chose to fight against the Nazis rather than be enslaved to the Italian and the Germans. Because, the Greeks are like untamed wild horses, like Pegasus and Bucephalus; a horse that can be ridden only by Purpose, so together they make miracles. Miracles like those we have made and will make in the future. Because, we may be in the situation they say we are, but Greek history proves that the Greeks always achieved great things while in difficulties. And this phenomenon is so consistent throughout the years, so I cannot stop believing in this people. That’s why when I make a mural anywhere in the world, I do not just draw “another cute picture”, but I aim to send the message that there is still something alive within us. I paint Greek because I am Greek. What else would you expect from me to do? I work for a forgotten Tradition, a painful Greek History. I illustrate myths of our tradition because they refer to the problem but also to the solution. This is how I exercise my social criticism. Those who have eyes to see. 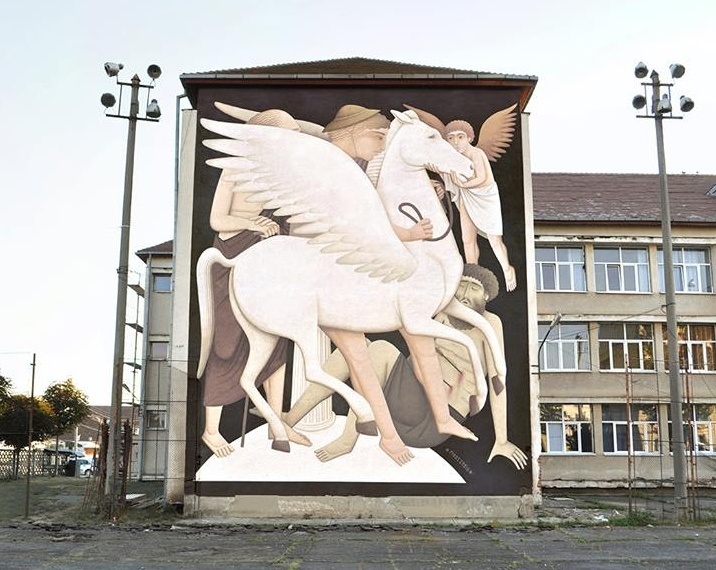 Recently I have returned from Romania where I painted the myth of Bellerophon and Pegasus at a school wall. Bellerophon is a relatively unknown hero of our mythology. Perhaps because, yet a hero, he is not an exemplar due to his unfortunate ending. 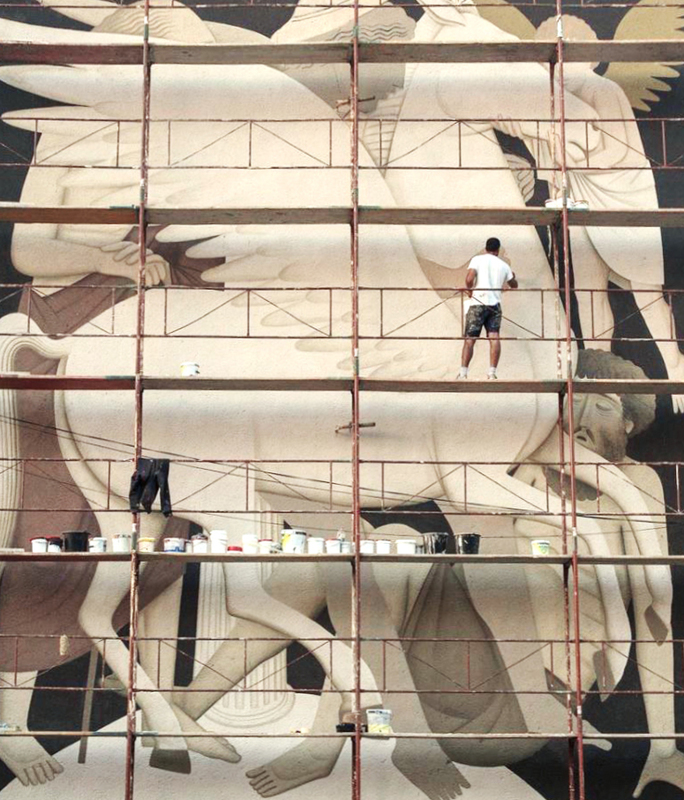 He was the first who managed to tame and ride Pegasus with the help of goddess Athena. 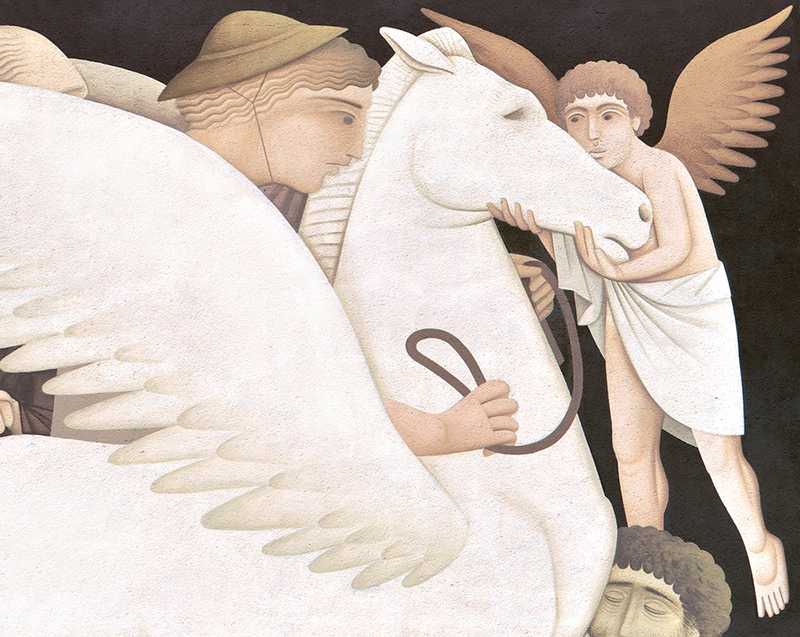 With Pegasus he won battles, defeated bandits, the Amazons and Chimaera. Gods were indeed in fond of him and protected him, but his arrogance crushed him. Blinded by the idea that his power can accomplish anything, he desired to reach the top of the Mount Olympus, the home of the gods. It was then when Zeus with a lightning threw him on Earth where, without Pegasus, he lived the rest of his life poor and forgotten. Fortunately, we write the History and its book always has another blank page. Will it say anything about heroes again? Well, it’s in our hands. 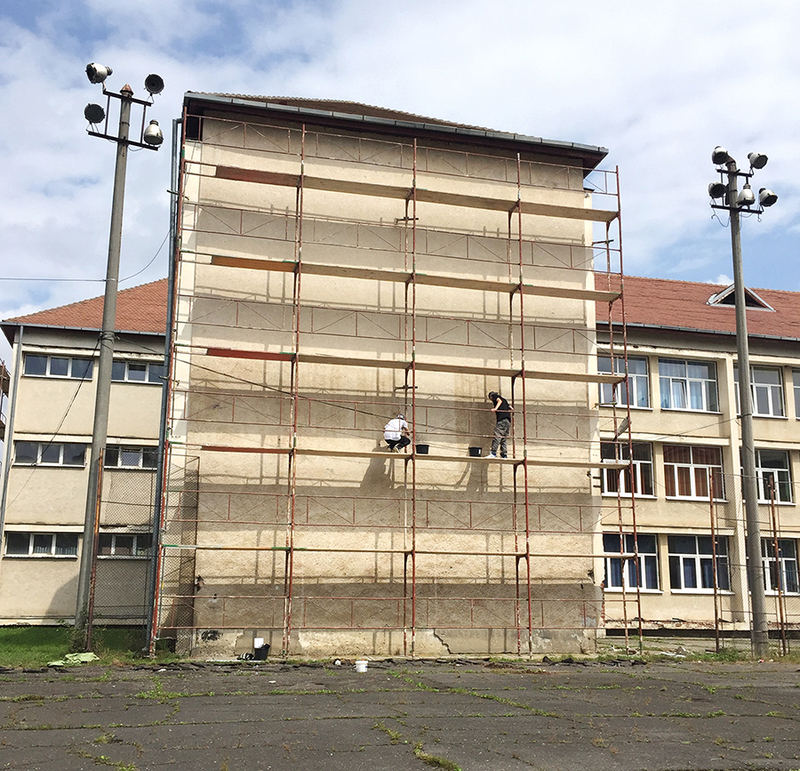 Many thanks to the organization of the Sibiu International Street Art Festival and my good friend Saddo to whom I owe this work.